All dogs are different, and each breed has a unique set of requirements when it comes to the fuel that they need to power their little engines. As breeds go, the Weimaraner is a fairly new one which has origins in 19th century Germany. Always traditionally considered a hunting dog, their diet still needs to mimic the same type of meat and protein that they have always traditionally needed. So, in this blog post, we are going to give you some inspiration for the best food to feed Weimaraners. Hopefully, this will help to narrow down your choices, as well as giving you some information about the range of positive features of each. As we mentioned at the start, your dog needs plenty of protein, and this is exactly what this dry dog food is packed with. Chicken, turkey, wild-caught fish, and nest-laid eggs are the main sources. At the same time, it is also a grain-free food which is unlikely to upset your dog’s stomach. One of the underlying philosophies of Orijen is to offer all the benefits of the kind of raw diet which wild dogs would have traditionally enjoyed. Everything is gently freeze-dried, and all of the natural goodness is locked right there into the bag. The main protein source of this dry food for adult dogs is pasture-raised beef. Supplementing this are additional vitamins and minerals from fruit and vegetables. It is also packed with amino acids to encourage lean, strong muscle development, and antioxidants to boost your hound’s immune system. Made in the USA by this family-run business, ingredients are sourced from sustainable sources worldwide. And you can be confident that you are not feeding your dog artificial preservatives, corn, wheat or fillers. If you are looking for Weimaraner puppy food, this could prove to be the ideal choice to feed to your miniature furry friend. Using high-quality ingredients, your dog will get its daily protein needs from the combination of duck, lamb, chicken, and eggs. Made in the USA, many large-breed puppy owners have offered rave reviews of this product. Ultimately, it will help to support your growing puppy as they make their journey into adulthood. Made using a grain-free formula, this dry dog food is suitable for all different life stages of your Weimaraner dog. It is also gluten-free, which is a relief for owners who have a particularly sensitive pup. The recipe has been specially formulated to meet the nutritional levels set out by the AAFCO Dog Food Nutrient Profiles. As you would want, much of the energy is provided by fresh protein, but the carbohydrates are limited, and it is low in fiber. Real duck is the number one ingredient in this wet canned dog food. The protein contained is designed to keep up the strength in your dog’s muscles to support their active lifestyle. It also contains various fruits and vegetables, as well as a fatty acid blend to leave your dog’s skin and coat looking at its best. While the ingredients come from sustainable sources the world over, the food itself is made in the USA. The prebiotic fiber makes it highly digestible, and nutrients come from blueberries, raspberries, and sweet potatoes. 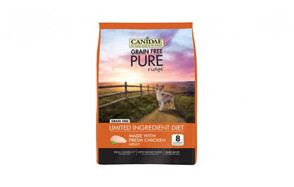 Sometimes, it can be hard to find a dog food which your pooch can easily digest, but this one is both grain-free and gluten-free to ensure that it goes down easily. The primary ingredient is real deboned buffalo, while it also contains high levels of omega 6 and omega 3 fatty acids. Also included within the food is farm-fresh fruits and vegetables, and there is plenty of glucosamine and chondroitin to promote healthy joints and hips. Another wet dog food, you can choose between different protein sources. There is also a variety for puppies, as well as those who are worried about their Weimaraner weight and think it needs more management. Each pack contains guaranteed mineral levels to support the metabolic function of your dog. Also included are greens and botanicals for the healthy skin and coat of your four-legged friend. It contains no meat by-products, corn, soy, wheat or artificial colors, flavors or preservatives. A premium dog food for canines at all life stages, plenty of protein is packed into the bag from chicken, pork, beef, and fish. The formula is also low-carb, so you can be sure that the energy that your dog is getting is long-lasting. Other nutrients necessary for a healthy pet which come in the bag include fatty acids, amino acids, vitamins, and minerals. Ultimately, its high nutritional value is one of the main reasons why so many dog owners love to feed it to their pooch. Just as you want from the best food for a Weimaraner, real meat is the primary ingredient of this Canidae large breed puppy food, and it offers the great taste that dogs love. 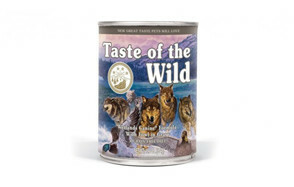 Since it is made with whole foods, it ensures a gentle digestion process for your canine companion. No wheat, corn, or soy is included, and you can choose between different formulas depending on your dog’s taste preferences and nutritional needs. Our final product on the list, this one consists of a formula made up of farm-raised chicken, brown rice, and sweet potato. One feature that you want from dog food is that it supports healthy joints, and this is what the glucosamine and chondroitin do. Supporting your dog’s immune system is another central expectation from their food, and this is helped by the essential antioxidants and vitamins contained within. Now that you have a better idea of 10 of the best dog foods for Weimaraners available, we will now run through some of the things to look out for when you are trying to offer your dog a nutritious meal. As we mentioned in the opening paragraph, high-quality protein is an important dietary requirement of a Weimaraner. Meat, fish, and poultry all contain complete protein sources with all 10 essential amino acids included. Remember, your dog’s body is best-evolved to digest and metabolize animal products ahead of plant products. Fat is another main food group which needs to form a central part of your dog’s diet. A couple of good-quality sources include chicken fat and salmon oil, which are both easy for your dog to metabolize. Your dog can also get supplementary sources of fats from plants, which contain positive substances like omega-3 and omega-6 content. While dogs don’t have the same nutritional need for carbohydrates like human beings, ingredients like fruits, whole grains, and vegetables can provide extra energy, fiber, and other essential nutrients. Bear in mind that while fiber encourages healthy digestion, an excess amount of it can lead to an upset stomach. Around 3-5% of crude fiber is a good guideline to follow. The age of your dog also has an impact on their dietary requirements. Puppies need plenty of protein and fat to support their healthy growth and development. However, you need to avoid overfeeding to reduce potential issues directly associated with musculoskeletal concerns. Once they have reached their full size, adults still require plenty of protein to maintain their muscle mass and may also need higher levels of fat than other breeds to keep up their high energy levels. And just like all dogs, they are bound to start slowing down when they get older. This is time to consider switching to a specially formulated senior dog food. Alternatively, you could offer them a blend of food designed to maintain their health into old age. Now, let’s examine the specific nutritional needs of Weimaraners in greater detail. While they don’t vary hugely from other types of dog, there are a few areas which are a little more specific, especially if yours is a hunting dog and not just a pet. So, here is a bit more about their specific nutritional requirements. Dogs are animals which thrive on eating high-quality protein, which generally needs to come from meat. While some plant foods provide protein as well, the main source should be meat-based. Unless your dog has any specific food sensitivities, chicken, pork, and beef are always great choices. However, there are a few other less conventional sources available such as salmon, turkey, and buffalo. Many of the best dog foods for Weimaraners list two or more of these protein sources in the first few ingredients. One of the main jobs of protein is to build and develop muscles, which is especially important if you have a dog who hunts. Also, protein helps to boost the immune system, which is obviously central in helping to keep your dog healthy. Don’t settle for substandard protein sources such as meat by-products. You should also be wary of too much plant protein, which your dog cannot digest as easily as meat. So, always check the back of the packaging to get a better idea how much protein is coming from meat and how much from plants. Vitamins and minerals provide the added extras which your dog needs, especially if they regularly take part in high-energy activities. Calcium and phosphorous are both important, as they help to keep their teeth and bones strong, as well as warding off musculoskeletal conditions such as hip dysplasia. Also, vitamins A, C, and E are all important for the antioxidants, which help to prevent common issues such as entropion and corneal dystrophy. Substances like glucosamine and chondroitin play a big role in helping your dog’s mobility and flexibility, as well as relieving any pain issues which they may be having. All dogs can benefit from this, whether they are hunters or not, and especially if they are advancing in years. Having a better idea of what your dog should avoid eating is another important aspect of being a responsible pet owner. There are plenty of irritants which can aggravate your dog’s sensitive stomach. Just a few of the most common include corn, soy, and wheat. So, you could make a special effort to steer clear of the dog food which contains these substances. If you have a pet who is especially sensitive to gluten and cereal grains such as wheat and cereal grains such as wheat and corn, these should all be avoided. There are plenty of high-quality, grain-free dog foods which we have already discussed in this blog post. Many dog foods center on their all-natural qualities, which are designed to keep their immune system strong. So, if you want to keep to this natural ethos, it makes sense that you avoid dog foods which contain artificial preservatives, colors, sweeteners, or flavors. Again, this is clearly labeled on many of the best dog food for Weimaraners which we have discussed above. Carbohydrates are not as important for dogs as human beings, so you don’t need to offer too many to your dog. Many of the best sources of carbs come from sources such as sweet potatoes or brown rice. Carb-feeding of your dog should be kept at the low to moderate level. While Weimaraners are tough and resilient dogs with a muscular build and sturdy frame, they can still suffer from a host of health conditions. So, let’s run through some of these in more detail, as well as what you can potentially do to help prevent them from becoming an issue. Weimaraners are deep-chested and therefore more likely to suffer from bloating. So, you should avoid food which is going to fill up their stomachs too much. While the condition on its own is not overly serious, it can lead to more severe and potentially life-threatening issues such as gastric torsion. Ultimately, this leads to the inward twisting of their stomach, which can, in turn, cut off blood circulation and require emergency surgery to be performed. Therefore, small meals during the day instead of a single larger one are better for them. Another common suggestion is to limit the exercise that your dog gets just before or after eating. Skin allergies are another common issue amongst this breed of dog. Conditions which are directly caused by ectoparasites like ticks and fleas tend to be especially problematic. Often, these occur when your dog heads out on a hunting trip or a similar expedition into the wilderness. When they bite or scratch their skin, this can lead to perforations and more serious problems arising. So, you should make sure that you treat this issue as soon as possible, whether this is through using medicated shampoo or another similar treatment. This breed tends to be more prone to suffering from eye conditions such as entropion and retinal dysplasia, which leads to folds in the retina of your dog. As you can imagine, this can end up being very uncomfortable for them. While these are sometimes the result of viral problems, they can also be the result of a vitamin A deficiency, so make sure that they are getting plenty of this substance in their diet. Medium and larger dogs are often more prone to suffering from hypothyroidism. A few of the common symptoms include hair loss, muscle depletion, tiredness, and a slow heart rate. Essentially, the issue is caused when the thyroid gland no longer produces the hormones as efficiently as it once did. If you suspect that this may be an issue, take your dog into the vet at the earliest possible opportunity. While this is not a specific health issue, some Weimaraner owners report that they have had issues with separation anxiety in their dog. One way that you can help to avoid this socializing your dog at a young age. Anxiety should be tackled as early as possible as it can lead to future digestive issues in your furry friend. Q: How often should my Weimaraner eat? A: According to the National Research Council of the National Academies, typical Weimaraner adult dogs who weigh around 70 pounds should eat a daily calorie intake of just less than 1,700. If you have a neutered dog this will be slightly lower, while those who are pregnant, or lactating will need more. Remember that this is only a guideline for dogs who enjoy an average amount of activity. True work dogs could need as much as double this amount. As for juvenile Weimaraners of around 40 pounds, they can exist on around 1,200 calories. Q: How much should I feed my Weimaraner? A: If your Weimaraner has a particularly active lifestyle, you should feed them on a more regular basis. However, if they live a more pampered existence, you need to reduce their calories accordingly. The last thing that you want is to run the risk of them suffering from obesity and developing any associated conditions. To minimize bloating, you should feed your adult Weimaraner dog twice a day. For puppies below six months old, a three times per day feeding schedule is standard. Of course, these recommendations are only general, and you can speak to your vet if you are looking for any more specific guidance. They will give their advice based on your pet’s age, existing medical conditions and lifestyle. 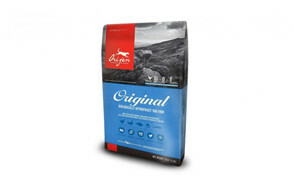 Our number one pick of the best dog foods for Weimaraners is this one from Orijen, which is a high-quality, grain-free, and nutritious source of energy. It only contains a limited number of ingredients, but this gives you a much better idea what is going into your dog’s body. All the fresh ingredients are gently freeze-dried into the bag, offering the benefits of a raw diet whenever your dog is hungry. Ultimately, it is a great food for keeping your furry friend happy, strong, and healthy.